Recorded at a benefit concert for Lesbian Line and London Gay Switchboard. Album features performances from eight artists. Tom plays War Baby, and then at the end there’s this rendition of Glad To Be Gay complete with backing vocals from the other artists. 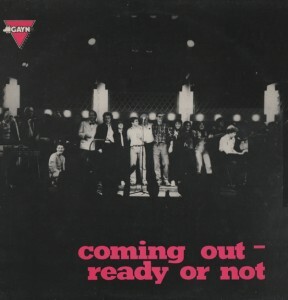 The lyric usually says Gay News is ‘our one magazine’ or ‘our last magazine’. In 1981, a new gay publication, Capital Gay, was launched, with its inaugral issue out in time for Pride Week. Based in London, but with considerable additional distribution in Brighton, it was given out for free. At its height, it had a circulation of 20,000 copies, about the same as Gay News had had. It ran for 14 years, ceasing in June 1995. By that time, the Pink Paper (founded 1987, and also free) occupied much of the same market.